(Newser) – All 222 passengers and 19 crew from a Singapore Airlines flight are safe and unharmed after a terrifying incident early Monday. The airline says the Boeing 777-3000 was on its way from Singapore to Milan when the pilot decided to turn back after receiving an engine oil warning message, the AP reports. 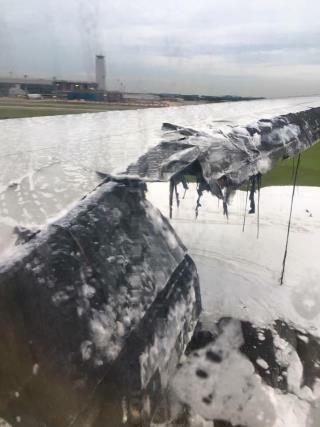 It landed back at Singapore's Changi Airport more then four hours later—and just after it came to a halt, its right engine burst into flames as horrified passengers looked on. "By the time the fire engines reached the plane, the flames were about a meter high," passenger Amit Jain tells Today. "When we could see the flames rising, some people were trying to remove their bags from the overhead compartments, which was crazy," he says. "I heard a few people scream 'Open the doors!' and 'Let us out!'" In general, I'm an admirer of Boeing aircraft, but the 777 has had more than its share of unpleasant incidents. I hope Singapore Airlines put these passengers on a 747, for their flight to Milan. Whew. Talk about close calls. I am glad all the passengers survived.